San Antonio Bay is just like any other Spanish resort, you could be in Majorca or Menorca or anywhere, very much of a muchness, Really quiet compared to San Antonio Town, but we were surprised at how many young ones there were (it's not like Magaluf) you can sleep at night. The resort was excellent as we were right next to cafe savannah, cafe mambo and cafe del mar which are some of the most excellent cafes to eat and drink at. It is also right next to the beach were you watch the famous ibiza sunset. There is also loads of supermarkets, restaurants and bars. Eden and Es Paradis are also about a 10 minute walk from the hotel, and you can get the disco bus from the resort to the other main clubs such as pacha and amnesia. 9 nights in a family room for 6 are bedding was never cleaned. When the cleaners did come it was just to replace towels an empty 1 bin. The shower and toilet throughout the hotel broke for a night which was an inconvenience when trying to get ready. I would say about 50% of the rooms had been overbooked so new holiday makers like my group had to be sent somewhere else which was a huge hassle and the staff did not help or apologise. The other hotel we were sent to had its own problems, we had some younger boys try to break into our room. Luckily we caught them but all the staff could say was’ if you don’t feel safe then don’t go out tonight'. The staff all seemed stressed with complaints coming from other holiday makers. They didn’t know what to do. This is a poorly run hotel. The location is not ideal and very unsafe at night with no lights to guide you. Taxis can be ordered behind the front desk but can take up to 30 minutes. This could have been bad luck on our behalf but it happened many of times. This hotel looks rundown and untidy. I can’t stress enough how unhelpful the staff where and would not recommend any one to stay here. San Antonio is full of bars, clubs and restaurants and it has a very nice vibe. I thoroughly enjoyed staying there and the beach we went to at Calia Gracio is lovely although there can be pink jelly fish if the weather is bad. The beach was clean and friendly with a very nice snack bar, cafe. There is plenty for all ages in San Antonio. The sunset strip is pricy but we had a lovely meal in Mint and watched the sun go down which was amazing. The strip gets busy and has a nice chilled atmosphere which is great. There is plenty to do including boat trips, pedalos, jet skis etc. I love Ibiza and would definitely go back. The local people were very helpful and friendy and San Antonio has a good information centre with English speaking staff. I have nothing but praise for the resort of Sanantonio Bay, its cleanliness,entertainment,beaches,bars and would not hesitate in recommending it to others. Overall, considering the reputation Ibiza is supposed to have regading youths, I found it to be a very pleasant and very clean Resort. The entertainment was excelent and the bars all made you feel very welcome. The Beaches were clean and tidy and I wouldn't hesitate to return there in the future. I would certainly recommend the resort to friends and give the resort a 5 star Raing. San An Bay beach is small, rocky in places and near to a few little bars and shops. Water was clear and calm for swimming and cooling off in August. 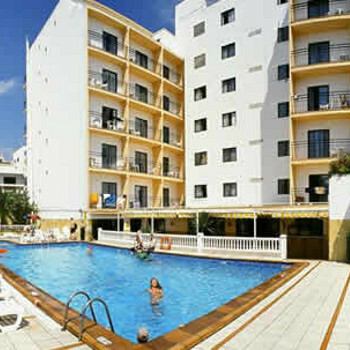 The hotel could not be any cleaner, the staff work really hard and are always very friendly and polite. The entertainment during the day was fine but at night could be better. The beach is lovely, it is cleaned every day by the hotel grounds men (as well as the pool areas) most people by lilos and take them down to the beach as the sea is lovely and warm and the kids love it, (if you get too warm lying by the pool take a walk down by the side of the hotel to the rocks at the sea as there is always a lovely breeze from the sea and it will cool you down in no time) Be careful when going into the sea as some of the rocks in the sea can be slippy, were something on your feet if possible. The taxi boat is situaited right outside the hotel and it takes you across to San Antonio every half hour 2euro 50 last boat midnight. There are also other taxi boats that take you to other beaches just have a look at the timetable, but be careful there is a jetty where people bring their boats and this part is very slippy so be very careful when walking on it. I can not recommend this hotel enough and will definately be going back. Definitely not a place for families or older holidaymakers. Great 18 to 30’s hotel!